Panama City Beach, FL is the place to be! Dinner Shows, Gospel Concerts and more! 7:30 PM Jan 7, 2017 Tribute to the King birthday bash! 706-647-5372 for info. Doors open at 6:45 pm and showtime is at 7:30pm. Tickets available at the theatre and at the Thomaston Upson Arts Council gallery as well. 6:00 PM Jan 8, 2017 This one Sunday, Jan 8th, Gospel hour will be a Tribute to Elvis’s gospel music since Jan 8 is his birthday. 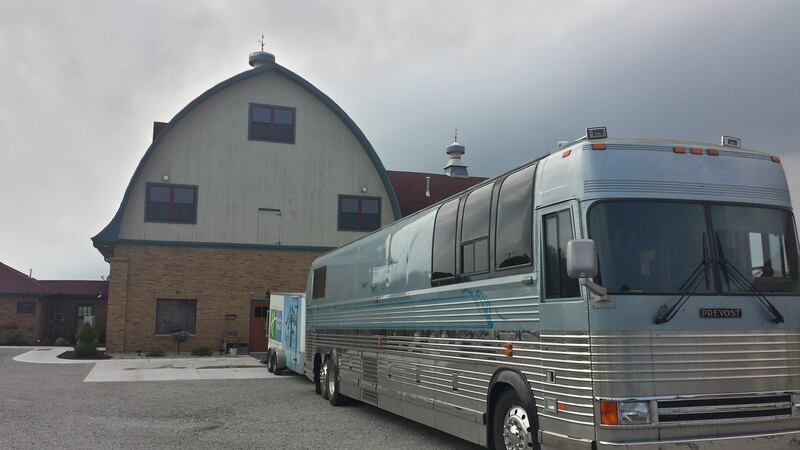 Todd and the band will be singing Gospel music at ‘The Chapel at the Ark.’ This is the church located behind ‘The Pour’ which used to be called Noah’s Ark. Concert begins at 6pm, doors open at 5:30pm. Free seats, love offering will be taken. 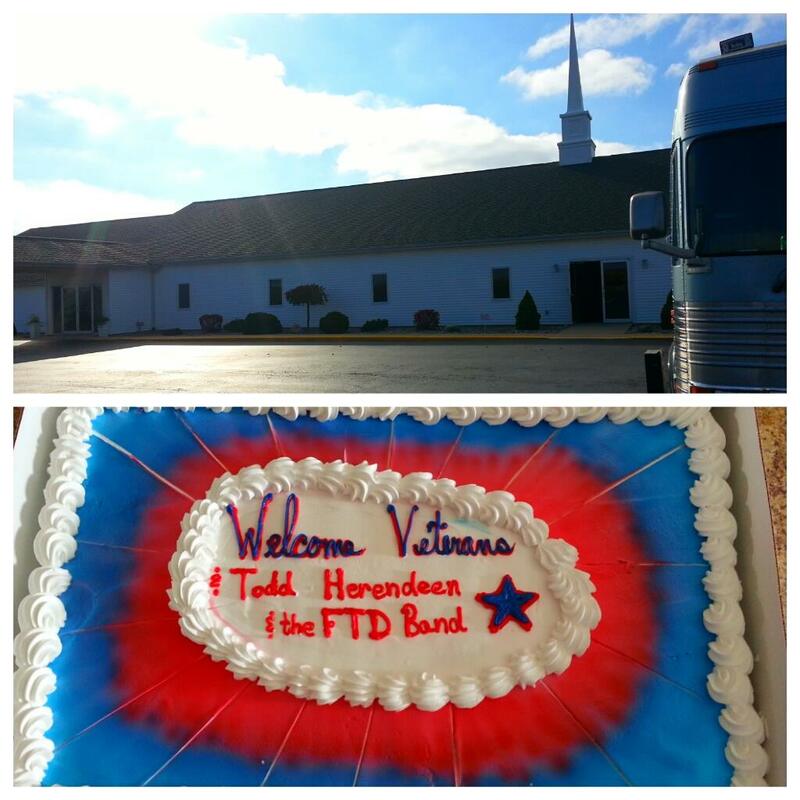 Todd and the band bring their gospel and patriotic concert honoring all veterans to Sebring, FL! All vets receive a certificate of thanks, suitable for framing. All the best hand clappin gospel favs and American classics! 7:00 PM Jan 18, 2017 Our winter dinner show venue! Tickets $10 for general admission or $22 for Dinner and Show! All Tuesday or Wednesday shows are Tribute to the Legends shows with music from Johnny Cash, Roy Orbison, Neil Diamond, Elvis and more. All Thursday shows are Tribute to Elvis only. The Boardwalk Beach Resort Convention Center Ballroom -9600 S Thomas Dr, Panama City Beach, FL 32408! Call 850-234-3484 for reservations. http://www.boardwalkbeachresort.com/ Doors open at 5:00pm. Show at 7:00. 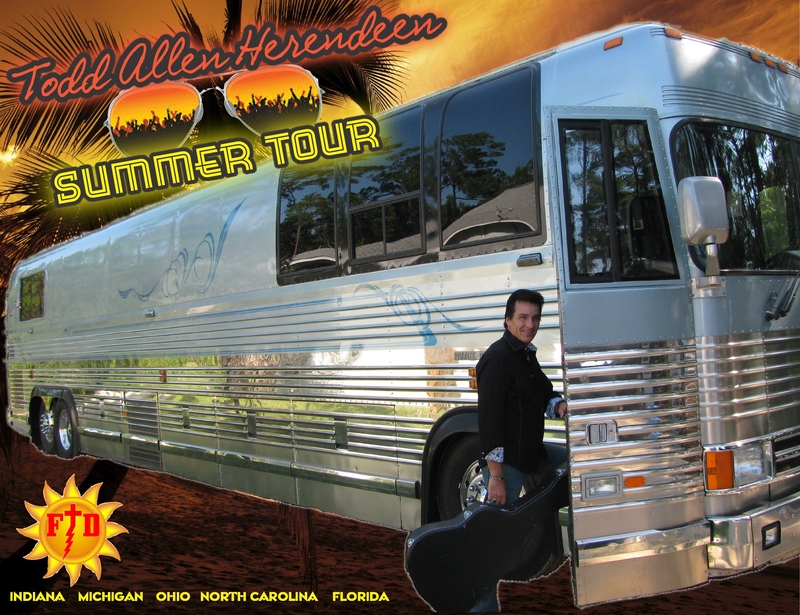 Third Annual Todd Allen Herendeen Cruise! Our exclusive concerts on the boat are only for guests who sign up through Travel Ventures for the Todd Allen Herendeen Cruise! Sail to Beautiful Western Caribbean: Cozumel, MX and Progeso, MX! 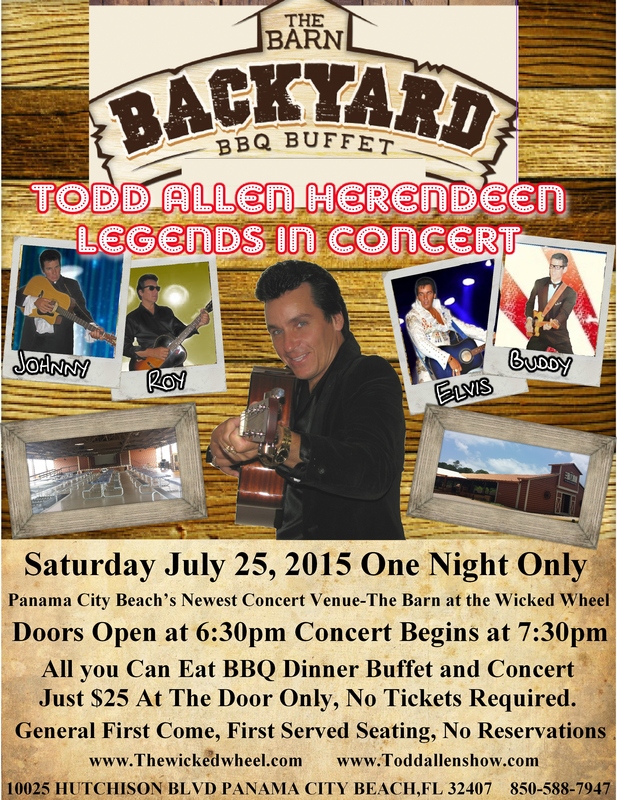 Also enjoy 3 exclusive Todd Allen Herendeen Concerts and Special VIP Meet and Greet Party on this 5 day Dream Vacation! Cruise Accommodations Aboard the Carnival Fantasy. – Deposit: $250 per person and due at the time of reservation. – Deposits are totally REFUNDABLE up until the balance due date . – Trip Cancellation Insurance is not included in the group pricing and is highly recommend. Please call our office for a quote. – Rates include roundtrip motorcoach transportation to the cruise ship terminal, accommodations aboard the Carnival Fantasy, admission to three private Todd Allen Herendeen shows, VIP party, all taxes and port charges. – Legal names, as they appear on the passport, must be provided to our agency at the time of booking. 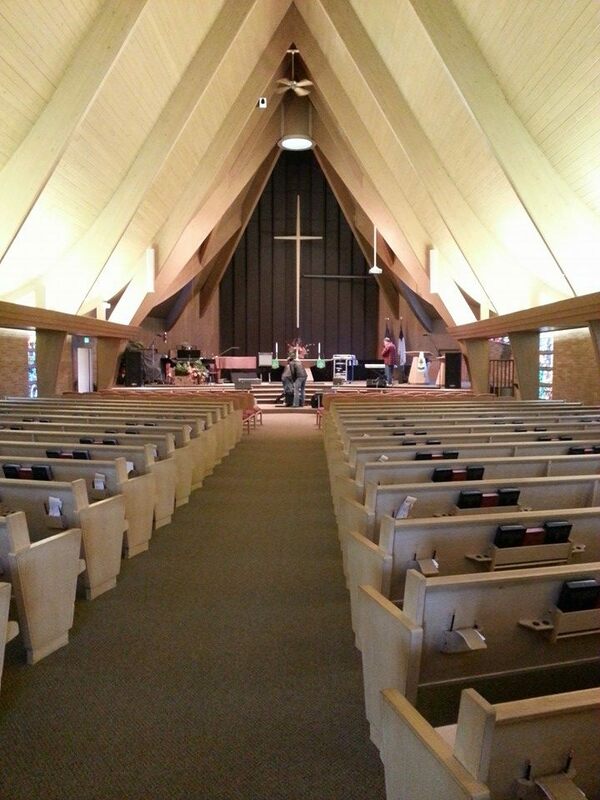 6:00 PM -Jan 29, 2017 Todd and the band will be singing Gospel music at ‘The Chapel at the Ark.’ This is the church located behind ‘The Pour’ which used to be called Noah’s Ark. Concert begins at 6pm, doors open at 5:30pm. 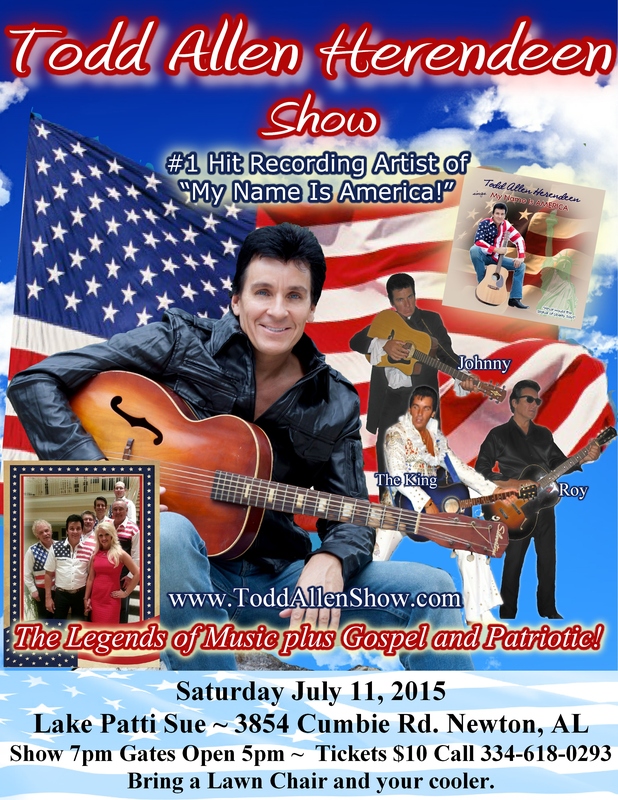 Todd and the band perform their Tribute to the Legends of Music! 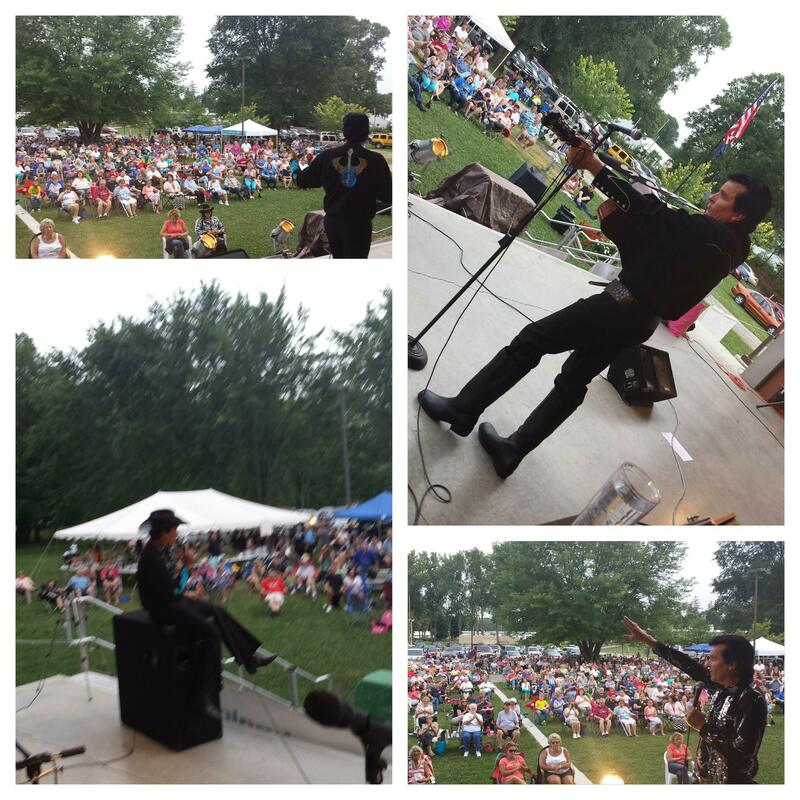 Roy Orbison, Johnny Cash, Elvis, Neil Diamond and many more! Showtime 7pm. Doors open 6:30pm. Dinner and show Benefitting Food4Kidz. Sharkey’s Beachfront Restaurant 15201 Front Beach Rd.Door Prizes, raffle, silent auction. Call 850-624-7485. Music starts around 1:30pm. 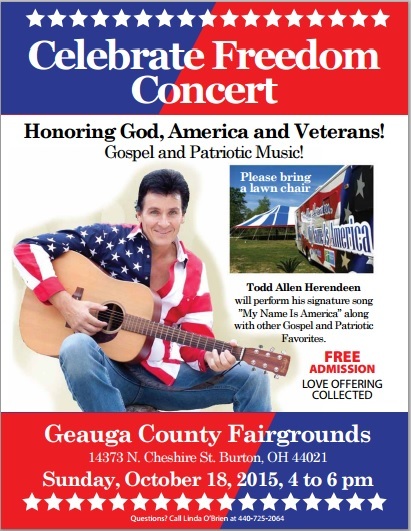 Todd and the band bring their high spirited, fan favorite show, of all the old time favorite Gospel favs with Tributes to America and Veterans too! Do not miss this! 6:00 PM Feb 5, 2017 Todd and the band will be singing Gospel music Sunday evenings at Oasis Worship Center. Open to one and all! Concert begins at 6pm, doors open at 5:30pm. 7:30 PM Mar 30, 2017 Todd and the band Bring their Full Live Tribute to the Legends show to the Cole Audiotirum at East Noble High School. 901 Garden St. Kendallville, IN 46755. Noble County Concert Association season memberships are available for $50, or tickets for this concert are available at the door for $20 each. Contact us via private Facebook message, by phone at 260-347-3536 or by email at noblecountyconcertassociation@yahoo.com. 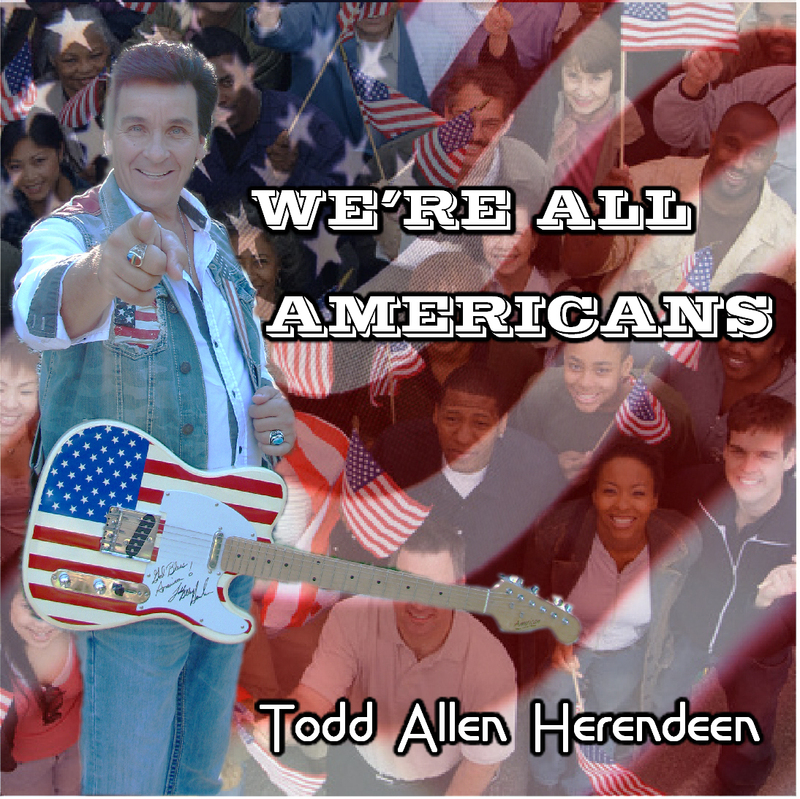 For more shows and details visit http://www.toddallenshow.com! We are into our summer season here on Panama City Beach, FL! We have shows Mondays, Wednesdays and Fridays at the Holiday Inn Resort. Shows are for resort guests, so check out staying there when you come visit our beautiful beaches! If you haven’t been to Panama City Beach, FL, you can’t even imagine what you are missing! The clear emerald turquoise water and white sand is unlike anywhere besides the Caribbean! Panama City Beach, FL . No filter on this! We have had a busy and blessed May! 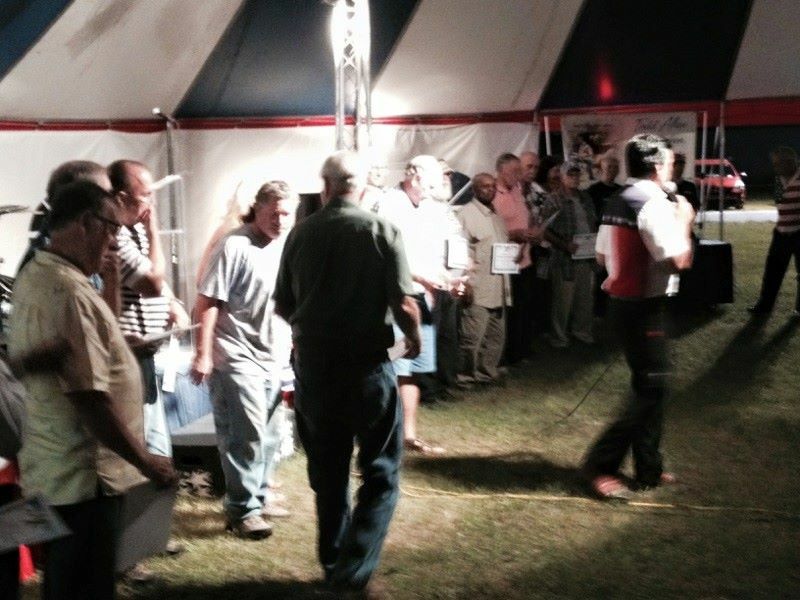 We hosted an 8 day Tent meeting in Panama City, FL. 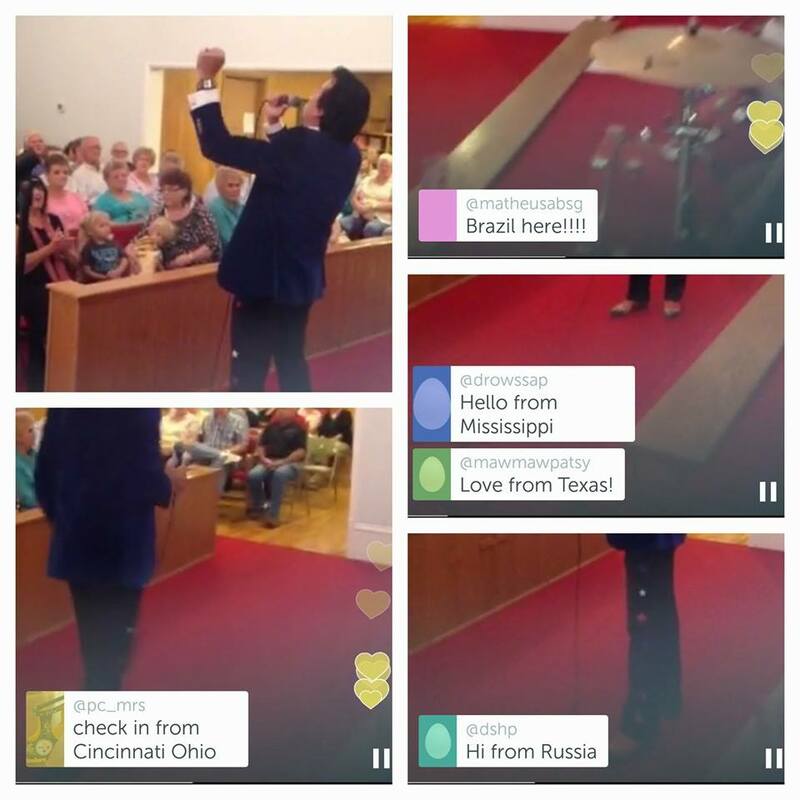 Uplifting and encouraging messages from different Pastors each night! 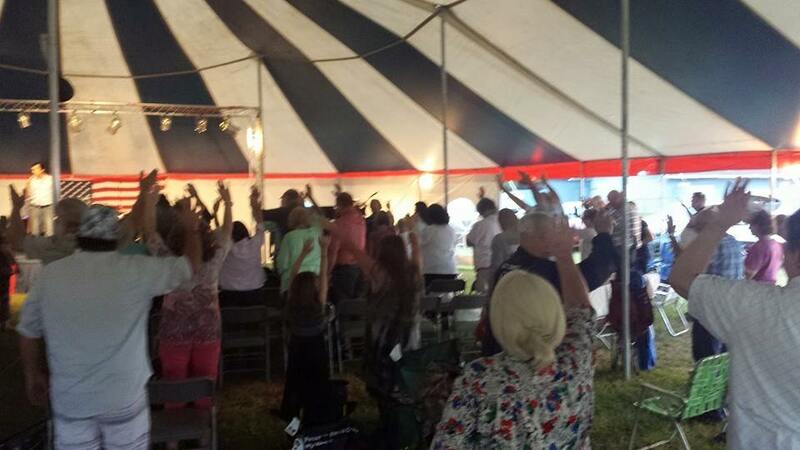 8 day Tent Revival of America, for 7:14 week, was such a blessing! Thank you to all the special folks who helped and made this possible! And to all the faithful friends who came every night! You did it for God, and not for us. He will bless you for it. Our whole theme was 2 Chronicles 7:14 – all of you humbled yourselves and prayed and seeked God this 8 days. 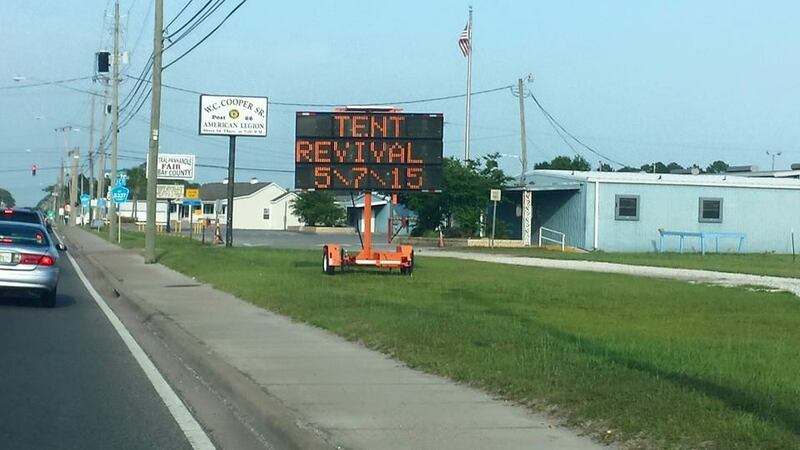 Let’s not let the revival stop just because the tent is down. Keep spreading the love of Jesus like never before. Be on fire for God. That’s what revival is. God bless you all and keep us in your prayers as we take Tent Revival of America all across our nation. We thank the Lord for this 8 days of healings and souls saved that were reported!! See photos below. 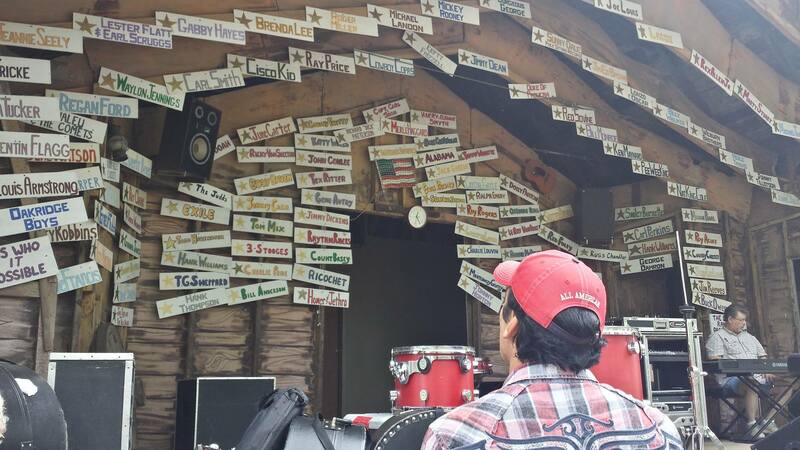 Memorial Weekend we headed to East Texas for two God and Country Concerts! Remembering those who gave their lives but we also ALWAYS honor past and present veterans. At every show. God is great all the time! Big thank you to our new friends at Grace Fellowship IN Flint, Texas and our friends and family in Poynor/LaRue and Country Chapel for letting us share our love of God, veterans and Country! 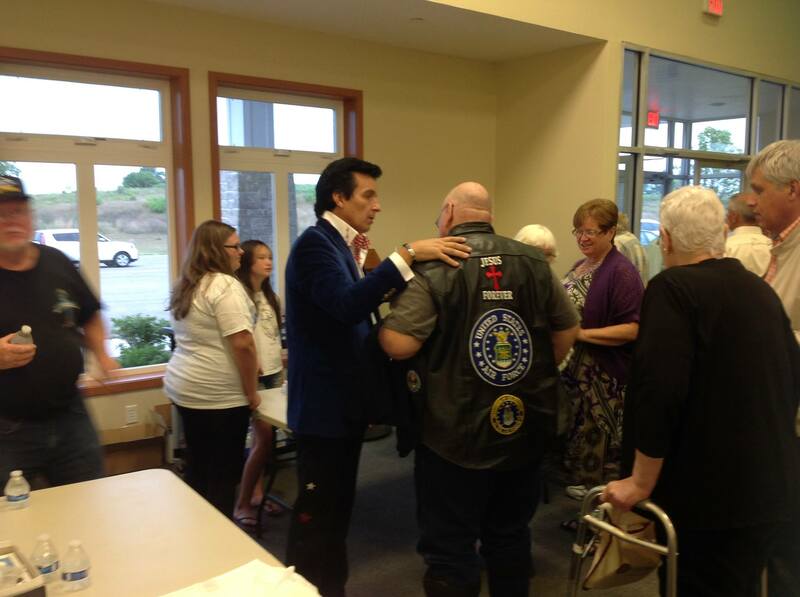 We love you Texas…till we meet again, may God Continue to bless you! God made a day of NO RAIN for concert in Flint, TX! Honoring veterans in Flint, TX. We always pray over them. We have a Stevenson, AL concert June 13 and in August we head to Northeast, Indiana for two different weekends! 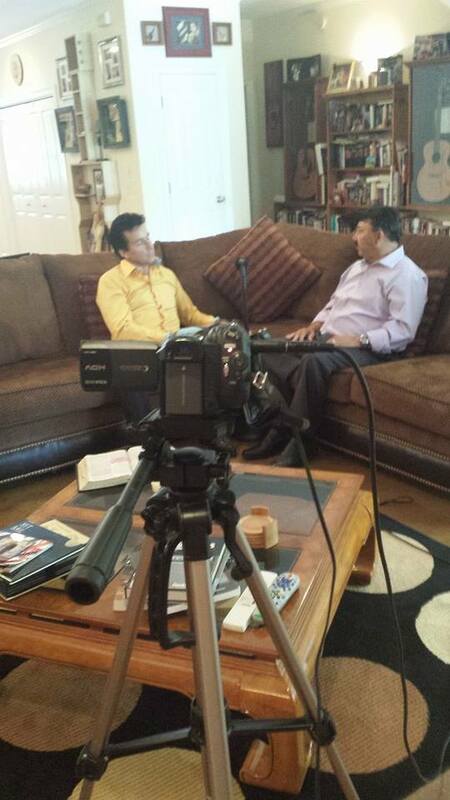 Make sure you check out our schedule at http://www.toddallenshow.com! Don’t forget you can purchase CDs, sheet music and much more on our online store also found on our website! We have had a very busy and exciting winter so far! Thanks be to the good Lord for that! We’ve seen so many of our northern friends coming down to join us in Florida. 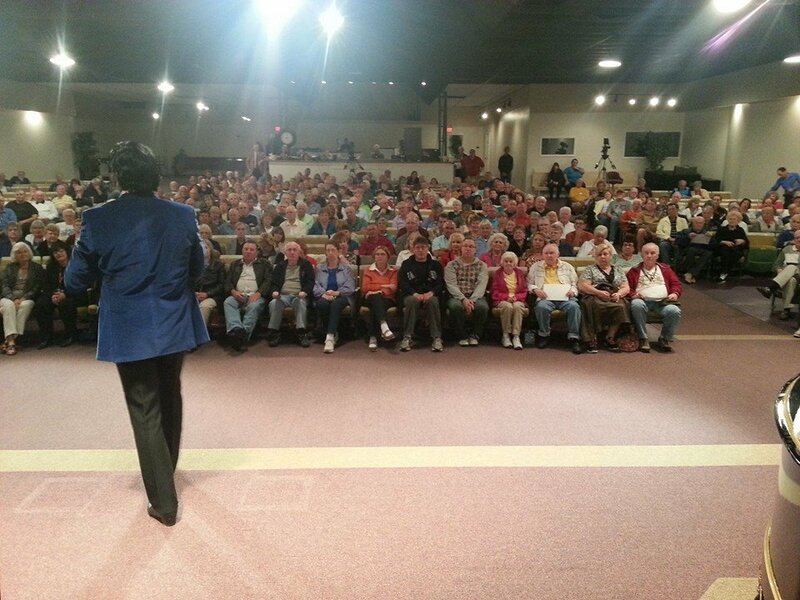 We thank you for coming back to us every year here in Panama City Beach, FL! The band and I have been to Thomaston, GA, Memphis, TN south central Florida and even the Bahamas so far and that was just in January! We recently performed on a 5 day Cruise to the Bahamas. What a fantastic time we had! Thank you to all who signed up with our local travel agent, Travel Ventures , and joined us! 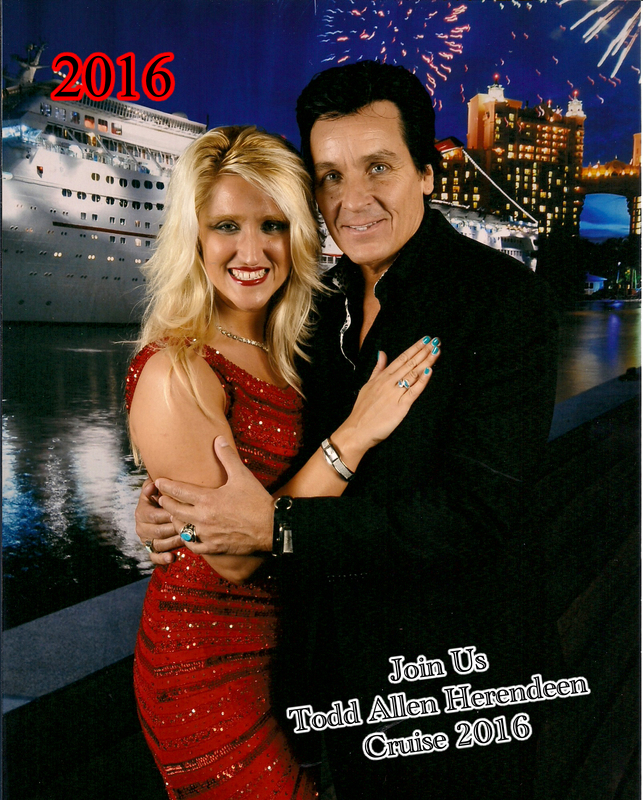 The Todd Allen Herendeen shows and VIP parties are all private events on the ship. 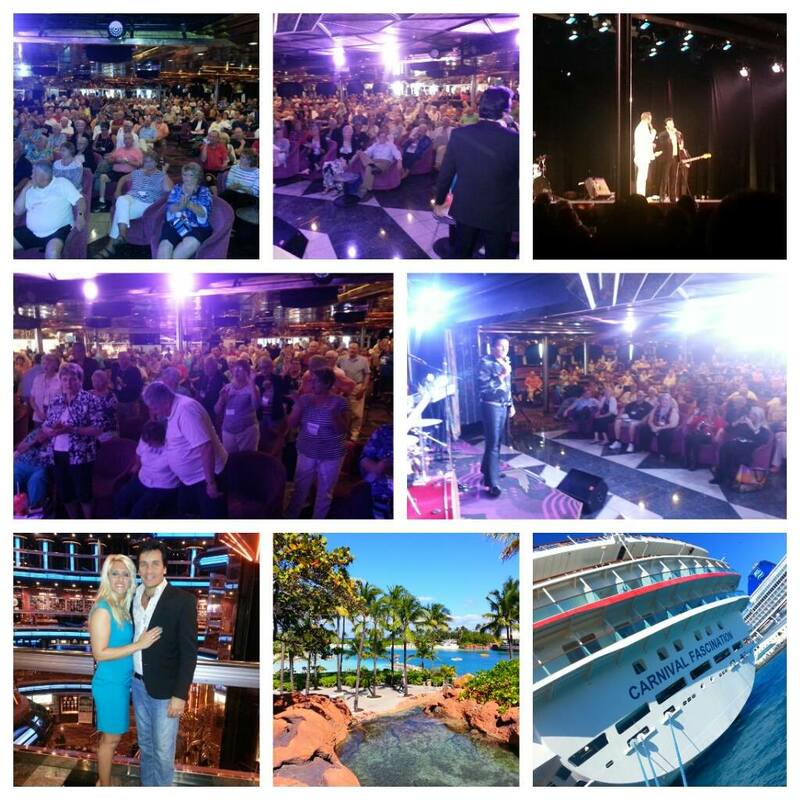 If you are not signed up specifically with Travel Ventures for the “Todd” Cruise, you cannot attend shows or parties. 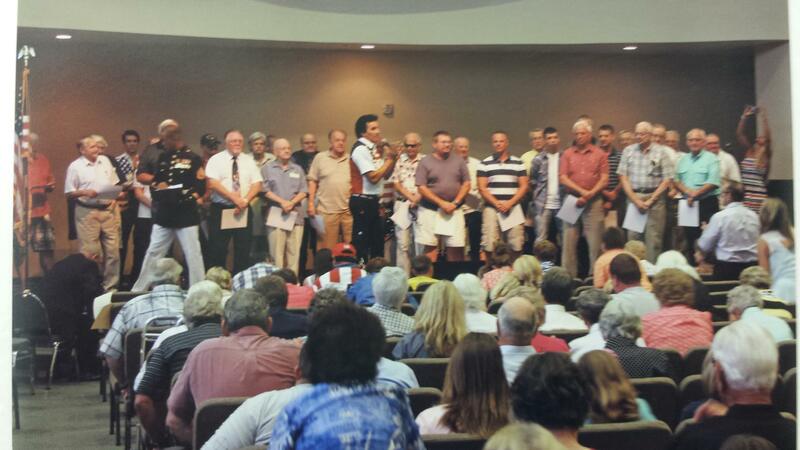 We also recently held our “God and Country” concert in Panama City Beach, FL at our home church, Oasis Worship Center. We were able to stream this live via the internet for the for first time ever. So many comments from all over the world from those of you who watched! Thank you, God is great! Plus the church was packed full too! You can watch Sunday morning services live at 10:30 am CST at oasisrevival.com. *Our Winter Dinner Show Venue is Boardwalk Resort Convention Center Ballroom again this year! Feb 17 and 24 will be our Tribute to the Legends show with Johnny Cash, Roy Orbison, Neil Diamond, Elvis and More. Feb 12, 18 and 25 are all Tribute to Elvis shows. Tickets $10 for general admission or $20 for Dinner and Show! The Boardwalk Beach Resort Convention Center Ballroom -9600 S Thomas Dr, Panama City Beach, FL 32408! Call 850-234-3484 for reservations. Doors open at 5:00pm and show at 7:00pm. DATE CHANGE FOR DESTIN SHOW! -February 21, 2015- Hawkinsville, GA Opera House 7pm Tribute to the Legends. 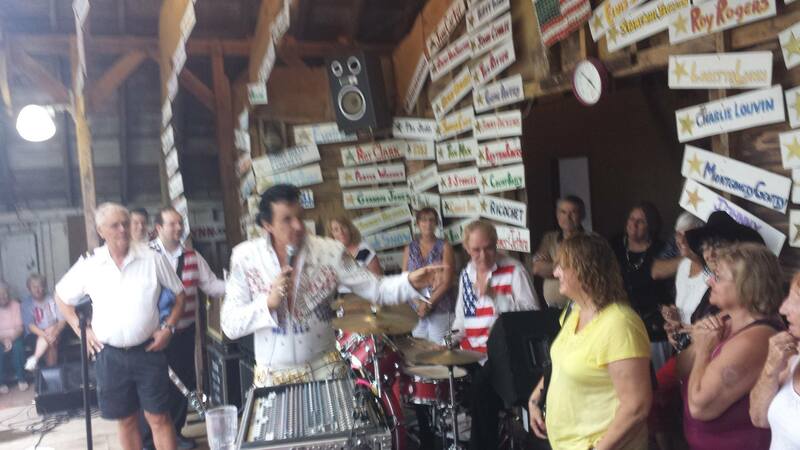 Johnny, Roy, Elvis and more! Call 478-783-1884. You’ve been asking so we got it put together! Feb 27-at 5pm. Panama City Beach, FL at Frank Brown Park. 16200 Panama City Beach Pkwy, Panama City Beach, FL 32413. 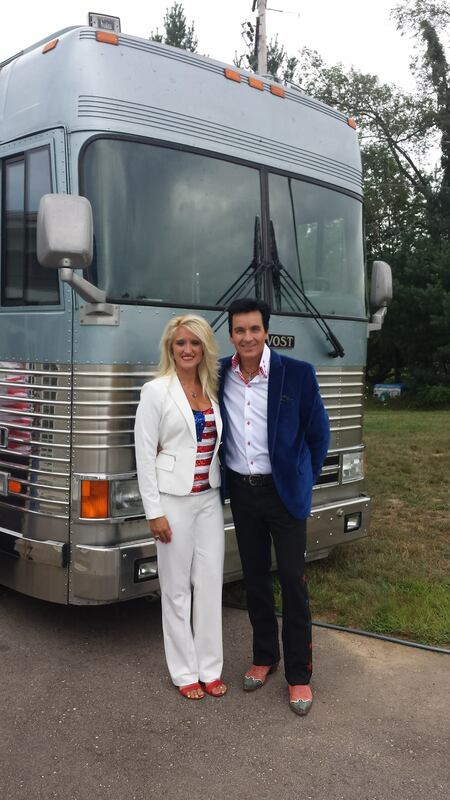 “God and Country Concert Honoring Veterans! 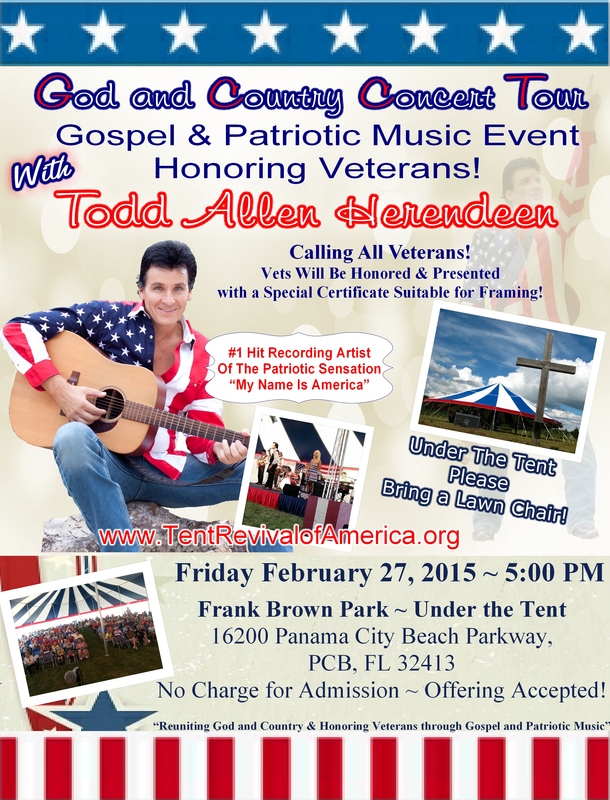 “ Gospel and Patriotic Music Concert Under the Big Red, White, and Blue Tent! All Military at the event will be presented with a special certificate suitable for framing! No charge for Admission, love offering Accepted. Please Bring a Lawn Chair for your own seating. Please share and invite folks! Thank you! 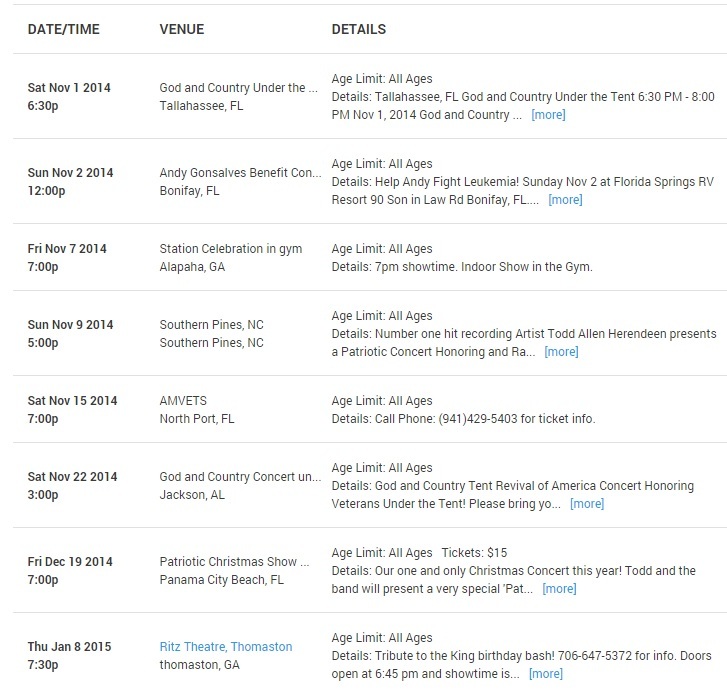 -February 28, 2015- Apalachicola, FL, Dixie Theatre. 2 Shows 3pm and 8pm. Tribute to the Legends of Music show! Roy, Johnny, Elvis and more! Showtime 8pm. 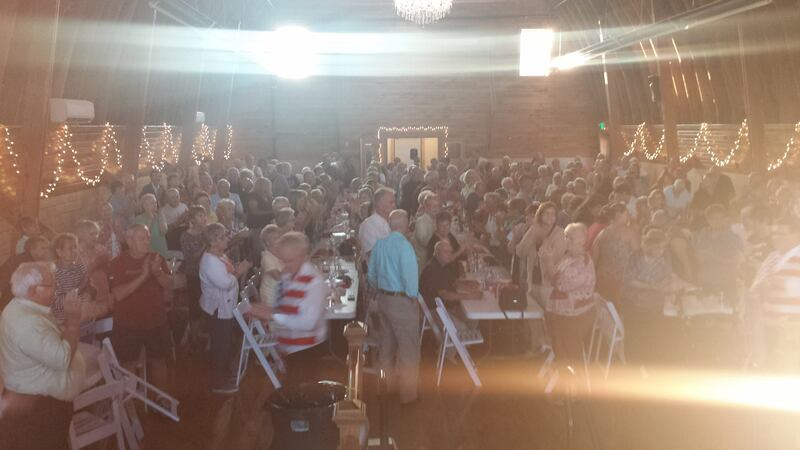 March 22, 2015- Garrett, IN, St. Joseph School Fundraiser. 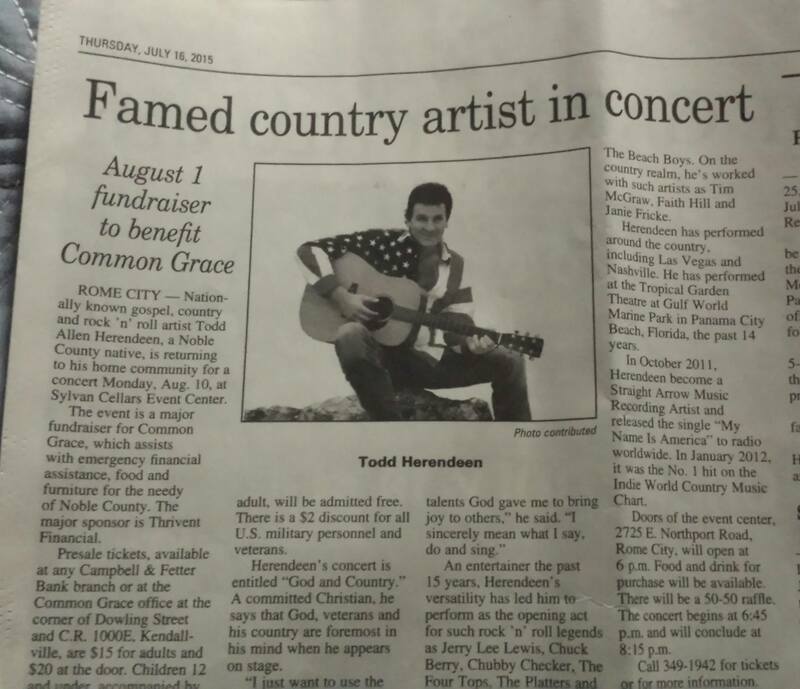 Alumni, Todd Allen Herendeen brings his Show and band back to Garrett to raise funds for the school! All proceeds benefit St. Joseph Catholic School in Garrett, IN. Concert begins at 3pm. Call 260-357-5137 for info and tickets. 301 West Houston St. Garrett, IN 46738. See our website for more and all details about show dates. Follow us on Facebook, Twitter or Instagram! ToddAllenShow . com has all things Todd and more! Our show room on the ship. 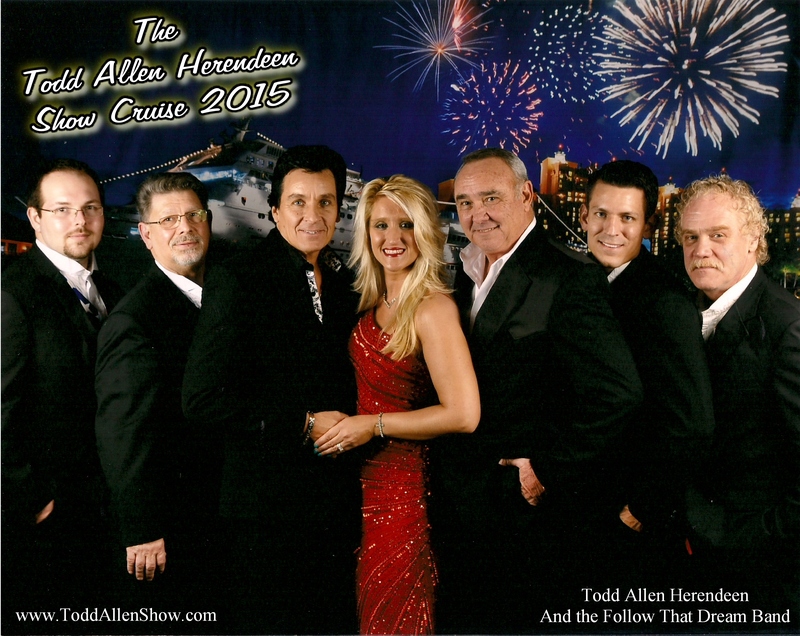 2015 Todd Allen Herendeen Cruise. Atlantis, Bahamas. 2015 Todd Allen Herendeen Cruise. Showroom on the ship. 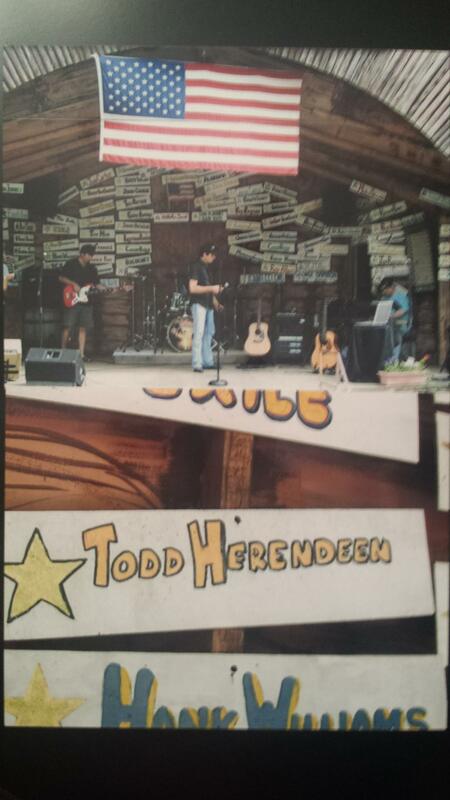 2015 Todd Allen Herendeen Cruise. New 2016 cruise! Sign up today! We had a great week recently up in northern Indiana! The entire trip felt like it had a wonderful purpose. 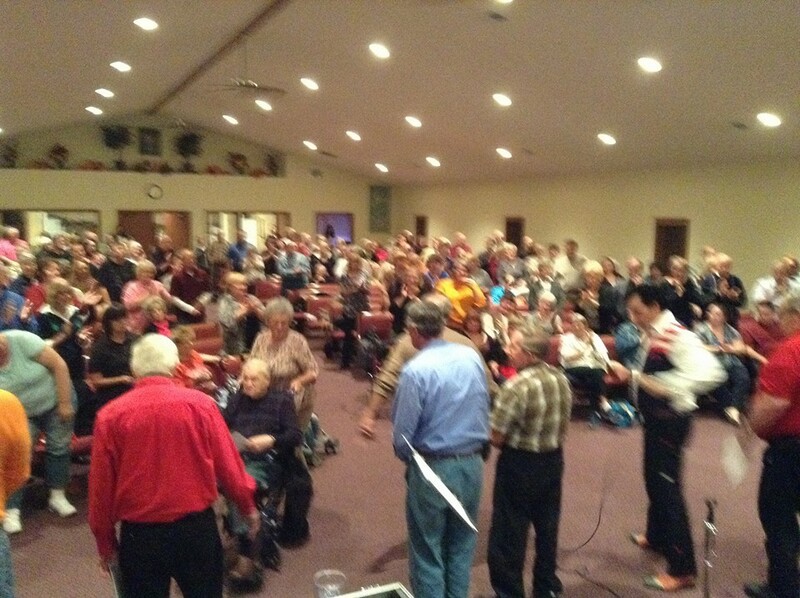 Tuesday Oct 21 St. Mark’s United Methodist church hosted our God and Country Concert Honoring Veterans. Thank you so much to Jane and Beth for the warm welcome and smiling faces! We even got to visit Miss Ebony’s memorial , which is just beautiful because it has her smiling face on it! Continue to pray for her mom Beth. 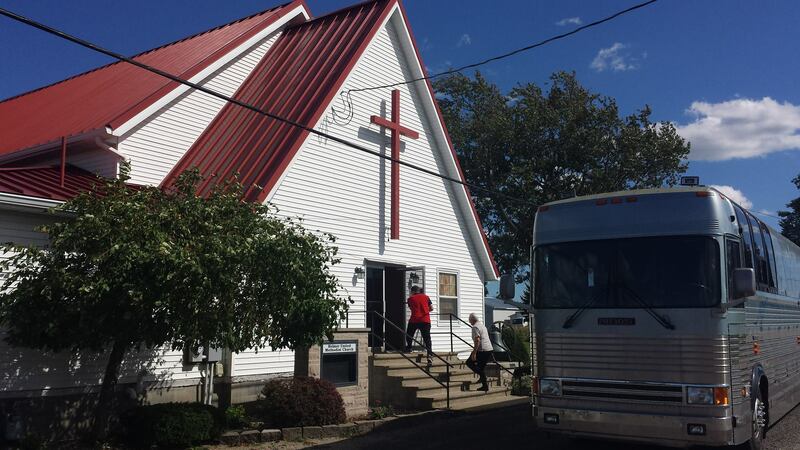 Wednesday evening’s God and Country Concert Honoring Veterans was hosted by Independent Full Gospel church in Ashley, IN. Amazing evening with a lot of prayers going up for many folks! Thursday morning and afternoon we made a few important stops around the area before our evening performance at the Auburn, IN WWII Victory Museum. We were asked to stop and pray for a young man named Parker. Help us continue to pray and believe for this young man to walk and be completely restored again! Parker was in a horrible car accident a couple years ago. He is already a miracle that he is alive. He is a joyful soul and has the faith! We got blessed by meeting him! 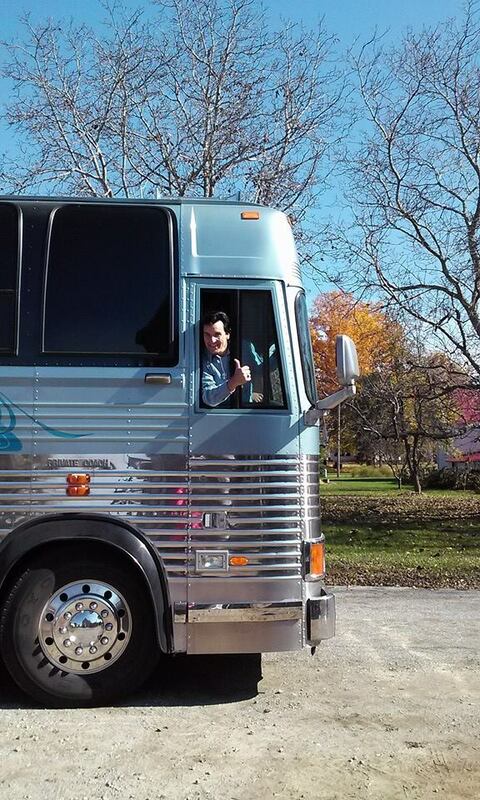 He sure got a kick out of going on the bus! God is amazing. We will keep you updated on this miracle! 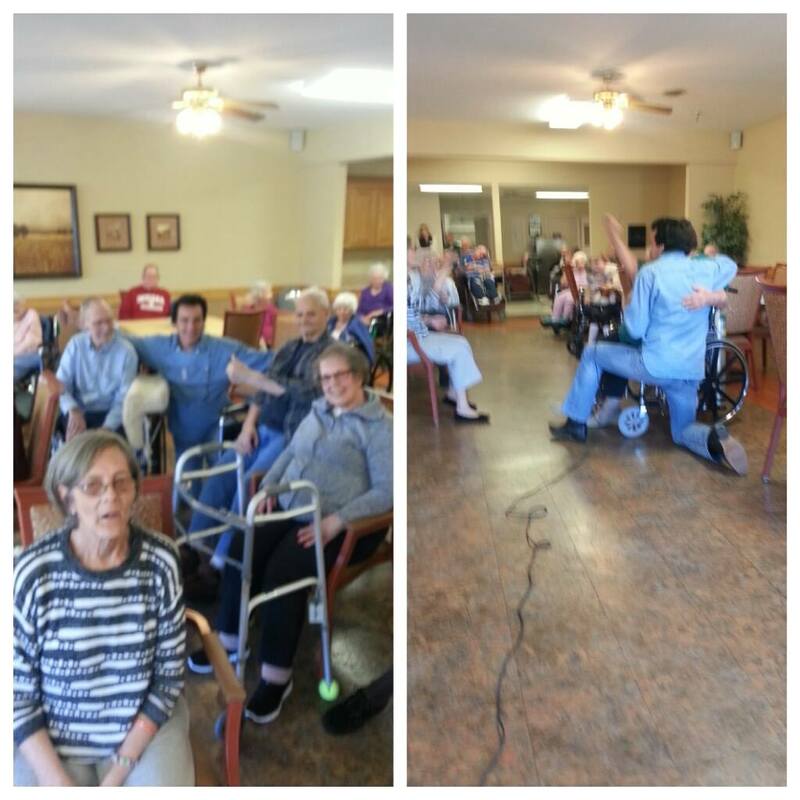 We also stopped by a nursing facility that one of our friends is in. 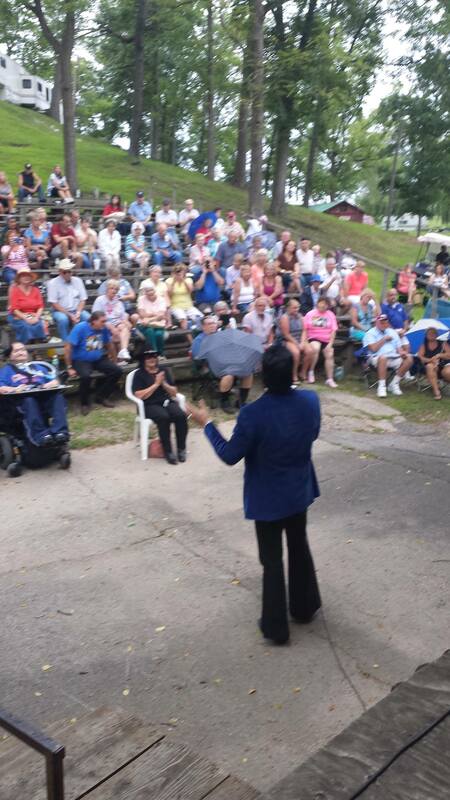 Sang a few songs and spread some joy and smiles! Thanks for a great night at the Victory museum in Auburn, IN and United way / Council on aging and anyone else who put the event together! Heard it was a record breaking crowd! 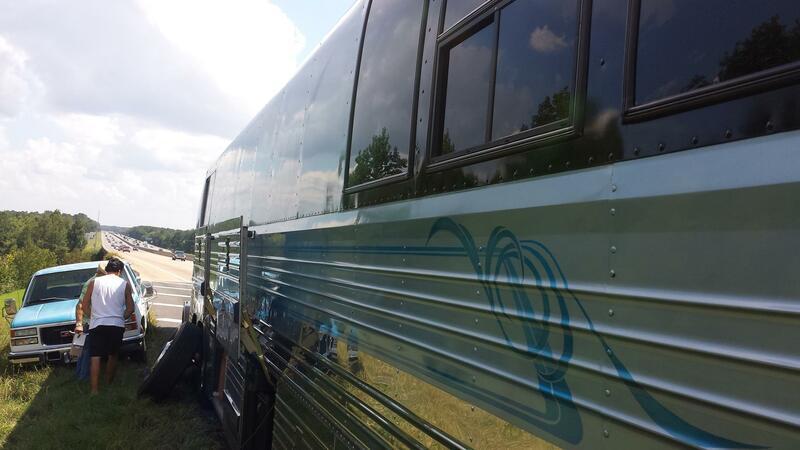 We did receive news that Thursday evening before we headed out of town, that a lady who had been at our Wednesday night concert had been a terrible car accident on her way home from it. 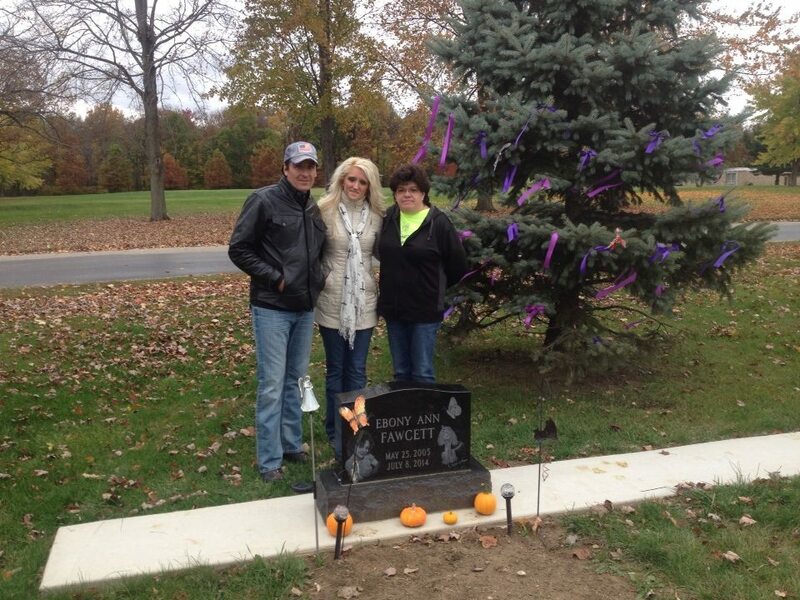 She was in ICU in Fort Wayne, IN. Thank goodness it worked out that we could stop by the hospital on our way out of town and pray with her! She was not awake, but her nurse Bethany was very sweet. Her friends and family continue to keep us updated on her improvements! She will be ok thank God! We share these things with you so that we can show you the miracle working power of the Lord Jesus is still very much alive and well today! We just want to share a little Hope and Love around, not for our Glory, but God’s! We hope these stories do bring some hope and joy to you as they did us. We are excited to do a God and Country Concert Honoring Veterans Under our beautiful Tent this Sat Nov 1 in Tallahassee, FL! Please bring your own lawn chair. Enjoy Southern Gospel and Patriotic Music! 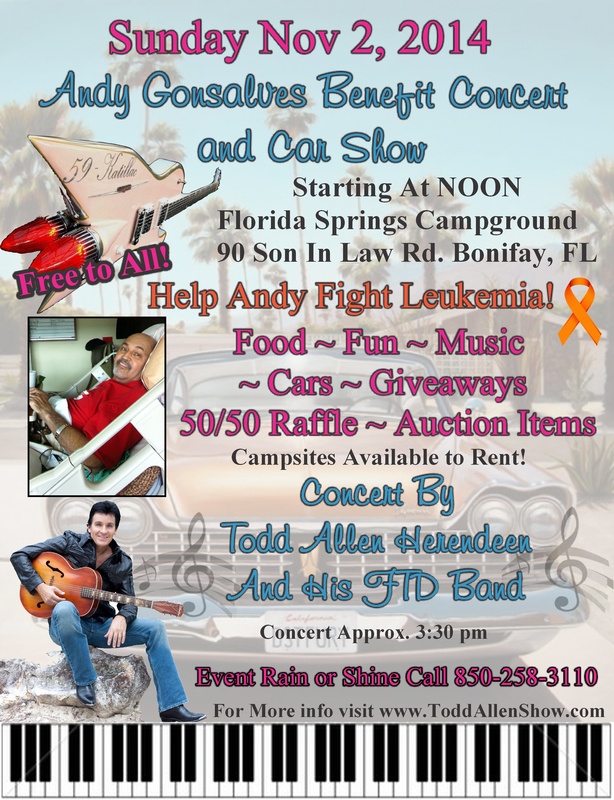 Sunday Nov 2: Help Andy Fight Leukemia! Sunday Nov 2 at Florida Springs RV Resort 90 Son in Law Rd Bonifay, FL. Food, Fun, Music, Cars, Giveaways, Auction items, 50/50 raffle. 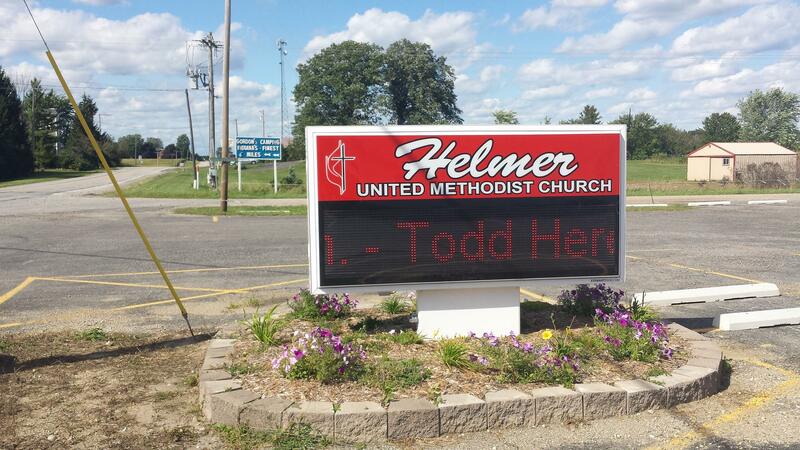 Events start at noon, concert by Todd Allen Herendeen and His FTD Band around 3:30pm. Campsites Available to rent! Event Rain or Shine. Call 850-258-3110. FREE! 90 Son In Law Rd. JUST ADDED: Sat Nov 22! 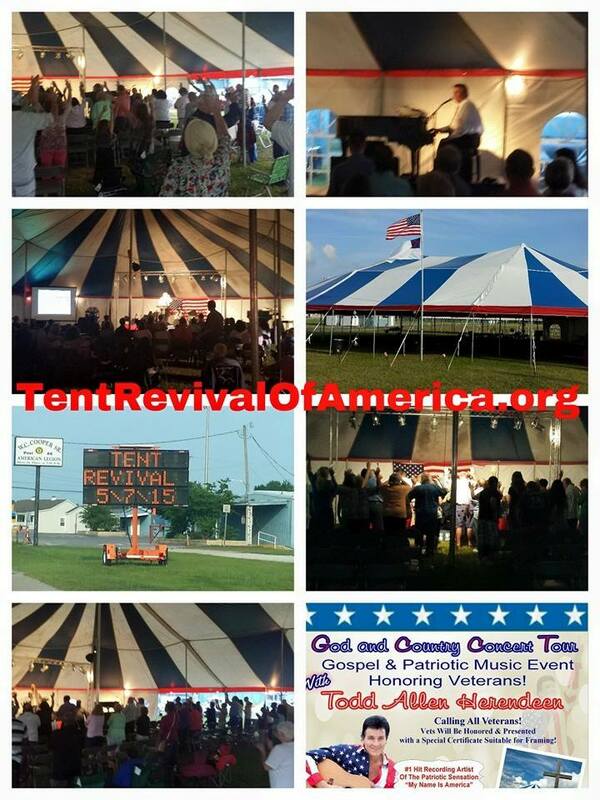 God and Country Tent Revival of America Concert Honoring Veterans Under the Tent! Please bring your own lawn chair. 3pm. Fun uplifting southern gospel music and all time favorite patriotic songs, while lifting up God and Country. Free Event – love offering accepted. Friday Dec 19: Our one and only Christmas Concert this year! 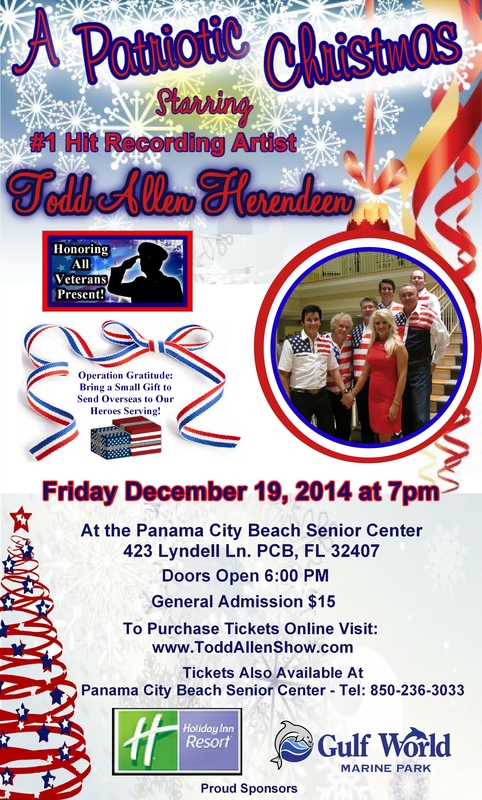 Todd and the band will present a very special ‘Patriotic Christmas Concert.’ Fun show with a mix of country, rock, Gospel, Patriotic and Christmas music! We are very excited to say that our brand new single will be out in just a few short days! “We’re All Americans’ music video will be coming out via Youtube and we will have the single available for Pre-order on CD and DVD. You will also be able to download it on ITunes and Amazon. We will let you know via many different outlets: here on our blog, email list, Facebook, Twitter, Instagram and our website! 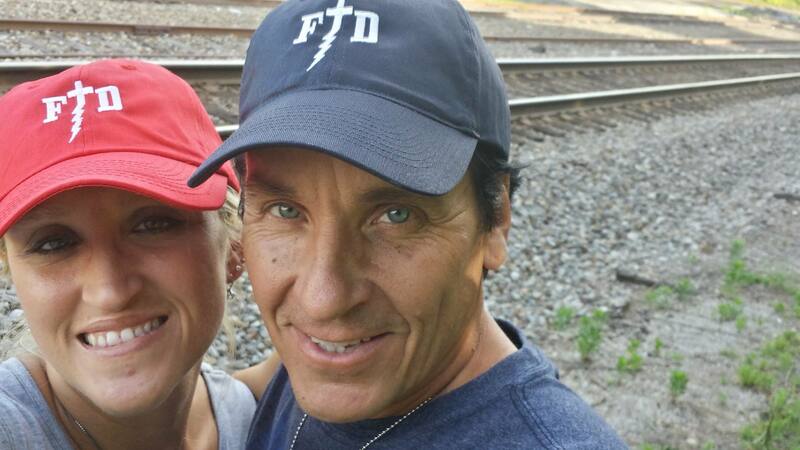 The writer of the song, Bobby Ray Koch did a great job with an uplifting, timely song! Todd is all about songs with a positive message! Hope to see you at a concert soon! 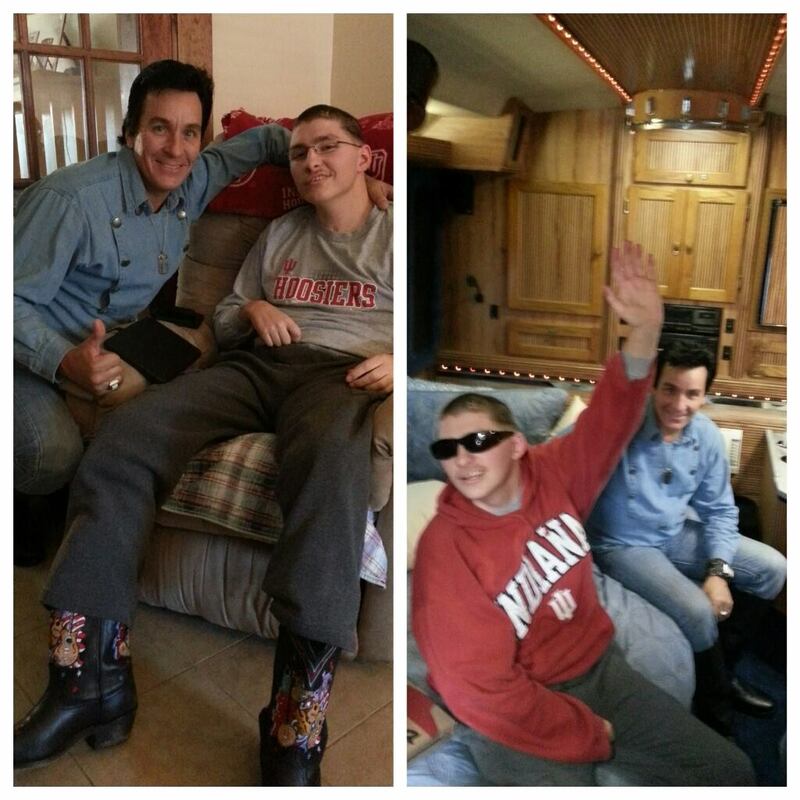 God Bless all of you for all your support and prayers!